A luxury watch is a crafted work of art, and made to function with incredible precision. Proper care and service of these beautiful timepieces is very important. And, when a luxury watch needs to be repaired, it needs to be serviced by a qualified master watchmaker to make sure it’s done right. By maintaining your watch in this fashion, you can ensure that your investment will hold it’s value over the years. It can be difficult to find a qualified repair technician, and sometimes it requires traveling or sending your watch in via mail in order to get it worked on. Luckily, for luxury watch owners in Orange County, there’s no need to travel far, because right here in Costa Mesa, CA there is a company who employs a master watchmaker in house, and a qualified staff to take care of all your luxury watch repair and service needs. That company is Jewelry-N-Loan located at 1872 Newport Blvd. just off the end of the 55 freeway in Costa Mesa. 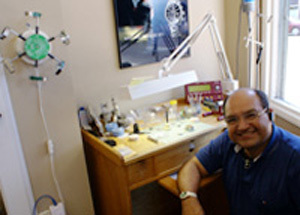 At Jewelry-N-Loan our master watchmaker is a second-generation expert who has decades of experience. Having this kind of expertise in house, allows Jewlery-N- Loan to provide our clients with one of the most extensive list of quality watch services in Southern California. Whether you simply need a battery replaced or a complete overhaul on your modern or vintage timepiece we assure you he will expertly meet all of your needs and exceed your expectations. If you’re in need of watch repair or service in Orange County, remember to contact Jewelry-N-Loan first, and make sure you get your luxury timepiece serviced by a qualified expert. We’ll get it done for your quickly, conveniently and with the quality work only a master watchmaker can provide.